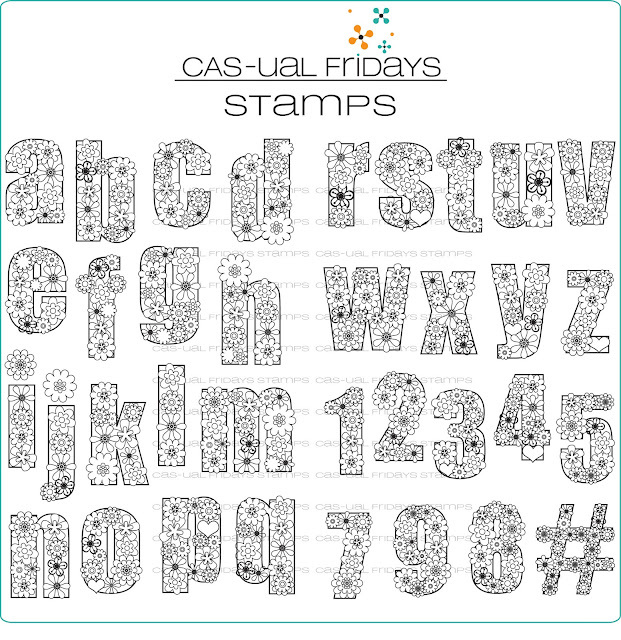 CAS-ual Fridays Stamps: August Release Day 1! Welcome to our August Release! and I have a stamp set for you that is completely different than anything I've done before. I've done lots and lots and lots of sentiment sets but I have never done an alphabet set! You all expressed such love for Peace Out and Flower Power that I got inspired. The problem I first encountered in designing this set was that in order to do the letters AND have the numbers too in the size I wanted, it couldn't be a 4 x 6 set. I really didn't want to do a 6 x 8 set because I know lots of you really love your 4 x 6 clear storage pockets that another stamp company has made super popular. (I love them too!) So, not willing to make the letters smaller, and not willing to ditch the numbers, I did the 6 x 8 layout...but I split it into two 4 x 6 sets packaged as one! Ta-da! You get everything I wanted you to have, AND this awesome set will still fit with your clear storage pockets! Wooot! This set is awesome! It will delight both card-makers and scrapbookers! It's only $29! And you can add this to your shopping cart on Friday! Let's take a look at what the Ink Squad created using this fabulous Flower-case Alphabet set! One of you lucky ducks is going to win this set! Leave a comment here telling me what is your favorite crafty publication? We've got three more delightful sets to show you this week and then, you'll be able to get any or all of them on Friday, aka Release The Sets Friday! 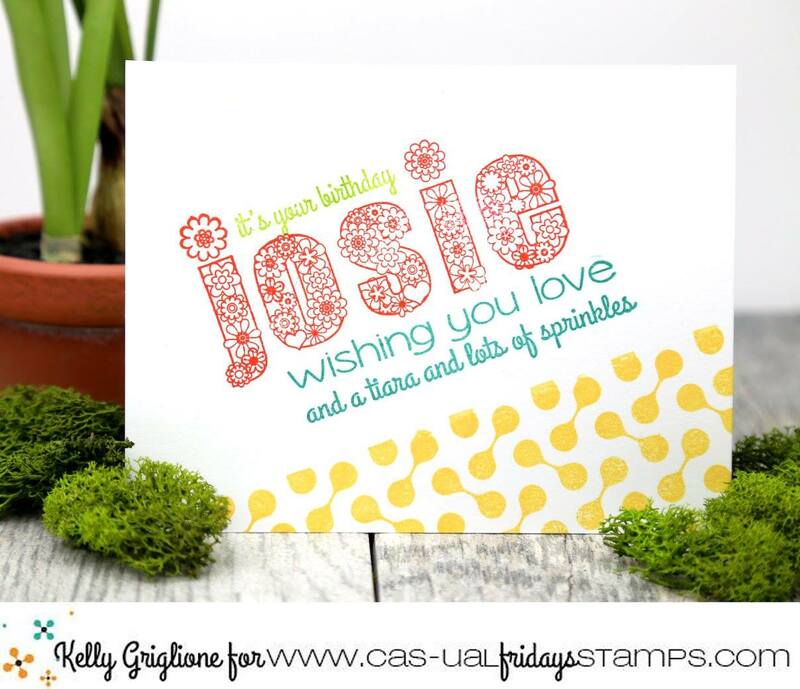 Craft Stamper. I love these alphabets, so pretty and versatile. Now isn't that just amazing!!! I've never seen anything like this. Love what the DT has done. I love Scrapbooks and Cards Today. Awesome new set Michelle.....I can't wait to see the rest of the release. Love this set. so versatile. I like CardMaker magazine. I love "Cardmaking and Papercraft", hard to pick a fave, I really like "Papercraft Inspirations", too. Thanks for the chance to win. I think CardMaking & PaperCrafts is my favorite. I LOVE this fabulous alphabet set! Thanks for the opportunity! My favorite crafty publication is: "Paper Creations Magazine". The Flower-case Alphabet set is awesome! You're doing a great job Cas-ual Fridays Stamps! Awesome! I love the Flower case Alpha set! My favorite publication is Cardmaking &a Papercrafts. What a super cute and fabulous set this is! All the cards today are so lovely. Card maker is my favorite. I love learning how to make new creations. What a fun and cute alphabet set! One of my favorite crafty publication was Paper Crafts Magazine. Sadly, it's no longer around, :( Though, I still have many of their issues to this day. ;) I also do like looking through CardMaker Magazine. However, my main source for inspiration and what not is just looking through blogs. These are cute and beautiful. What a lovely and unusual way to embellish. Love them. I too don't have a particular publication. I get my inspiration from pages on FB: thefrugalcrafter; Gina K; Jennifer McGuire; and others that happen to pop up and catch my fancy. Love this stamp set, it is too adorable! My favorite is Cardmaking & Papercraft from the UK. Amazing set! I'm not aware of any publications but Pinterest and YouTube are always my go-to helpers!! My favorite publication is Papercraft Inspirations from the UK! What a darling set! My favorite publication is Scrapbook and Cards Today. I love this alphabet set! So cute!! My go to publication is Card Maker. Such a cool set! PErfect fo radding my new granddaughter's name to everything! Slap me...I don't read crafty publications...I read and watch tutorials a lot though. Incidentally, sooooooo glad you came out with these floral letters...AWESOMENESS! I don't read crafty publications. I also watch tutorials and visit Pinterest a lot. This set is so awesome. I love all of the different creations that you all have come up with. Wonderful set and the inspiration from the DT is awesome. I seldom buy magazines but love Take Ten. A truly beautiful set & so clever to divide it in 2 for storage purposes! My favorite magazine is Take Ten by Stampington who publishes work by lots of different people--not just the "in crowd" folks. I want a hard copy to use when I'm away in my trailer or even on the deck--just don't like using my laptop outdoors & it isn't the same to look at something on-line. Yep--I'm an oldie (but goodie, hopefully)--haha! I just received a subscription to Mary Jane's Farm. issue. I also like the Cards magazine. Love the alphabet and numbers. Fabulous set. I use to get Paper Crafts magazine. Now I mainly look online but have enjoyed Cardmaker magazine and Scrapbook and Cards Today. I love this alphabet. I love any craft magazine that includes a great die or stamp set. What a sweet and lovely set, I am kind of excited that fills my crazy desire for coloring now! I am a big magazine fan, I read almost all I can find but Take Ten probably one of my top! CardMaker but I would loe to try on Take Ten. I love this alphabet! So darn cute!!! My favorite was Papercrafts I still look at some of my issues for inspiration. Awesome cards ladies! I love Cardmaking and Paper Craft. Super cute alphabet! Scrap and Stamp Arts is my fav stamping mag as it always has a technique article. I really dont have a favorite publication, but I have been pointed to and reviewed Cardmaker magazine periodically. LOVE this alphabet! Oh my! All are super cute, love this pretty set! My crafty publication favorite is CardMaker Magazine! I love this set. My favorite crafty publication is CardMaker. Beautiful set! I like CardMaker magazine. Wow! I love this new adorable stamp set!!! All the cards are really gorgeous!!! My fav is Scrapbooks and Cards Today. This alphabet is too awesome! I have to say, I don't really look at publications anymore with the arrival of the internet, blogs, and pinterest. I used to subscribe to a magazine called Cards by Northridge publishing. 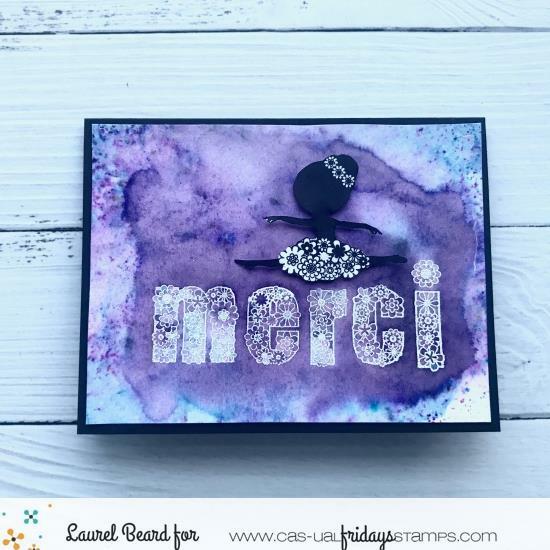 Wow.. wonderful stamp set..love the beautiful cards from FAT..Simply awesome..and my fav magazine is Craft Stamper. Luv it! I never really grew out of my 'mod' days! I still doodle flowers and lava lamp blobs! Don't buy many magazines these days so I rely on various FB groups and YouTube for my information! Squeee!!! a MUST HAVE set!!! I love the Stampington magazines and Daphne's Diary. I like Just Cards and Take Ten. It's fun sitting down with a cup of coffee (or tea) and leafing through the new issues. I used to love PaperCrafts, which no longer exists. I sometimes order magazines from the UK when they are on offer, such as Creative Stamping and Papercraft Essentials. Love this pretty alpha set! 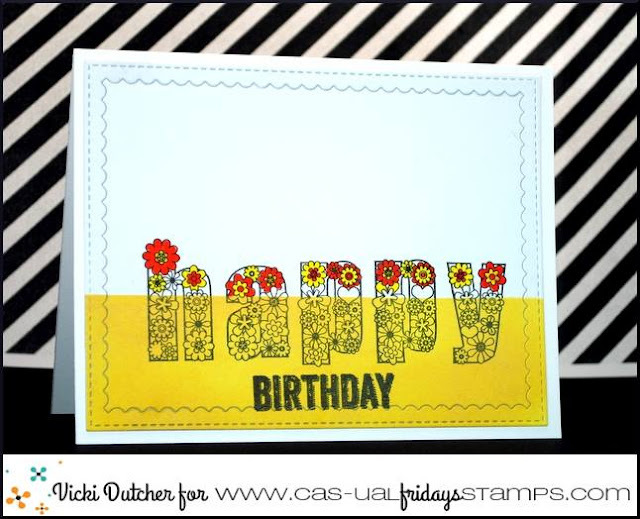 Rubberstampmadness is my fave publication! Wow! What a fab set! So beautiful and versatile. None of the paper magazines are available to me. 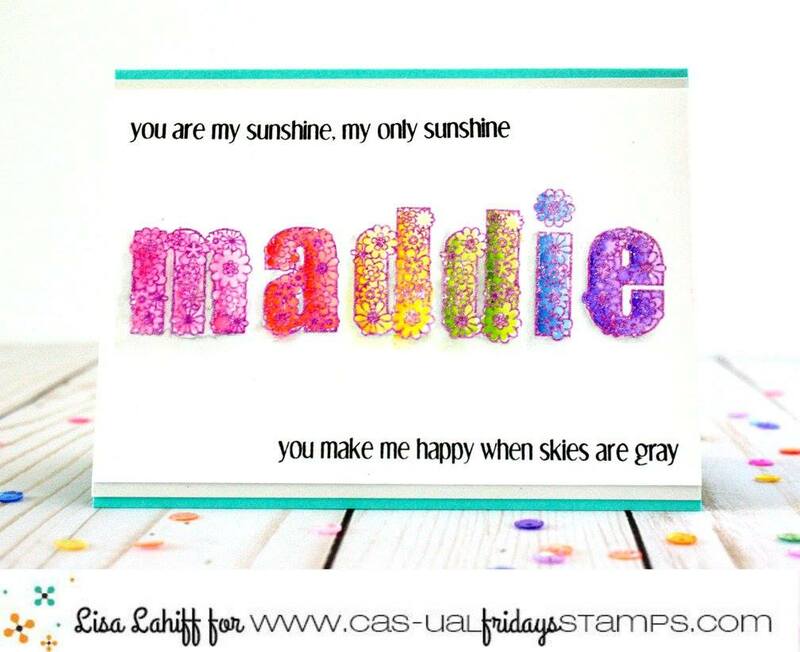 I love the Splitcoaststampers tutorials. And I am a huge fan of Jennifer McGuire and Kristina Werner's blogs. I don't subscribe to any crafty magazines. I go to all the blogs for my inspiration. Love this new set! Wow, wow, wow! I think this should be my very first alphabet stamp set! I just never found an alphbet set that was creative enough for me...I finally found it in your Flowercase Alphabet set. Thank you for this wonderful chance to win them. Wow, what a beautiful alphabet set!! It looks fabulous in all of the different ways the DT used it! I don't have a favorite crafty publication. I do love magazines, but never have time to read them, it seems!